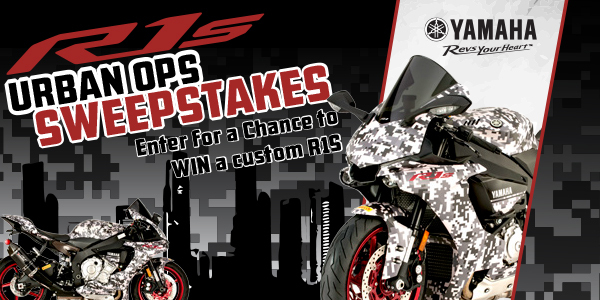 Yamaha Motor Corporation wants you to enter for this once-in-a-lifetime opportunity for a chance to win this custom Yamaha R1S worth nearly $20,000! One (1) Grand Prize: (a) One (1) new 2016 Yamaha R1S Motorcycle, customized by Yamaha with slip on muffler (post Catalytic converter), clutch & brake levers, rear-set foot rests, frame sliders, fender eliminator, stand spools, custom camouflage wrap and Pirelli tires; and (b) One (1) voucher from Pirelli for the lesser of three (3) tire replacements or three (3) years of free tire replacements. Approximate Retail Value (“ARV”): $18,000. This Sweepstakes ends on 07/10/17 and you can ENTER ONCE to win.